I’ve already blogged about the CBCA shortlisted Younger and Older Reader books. In two parts, I’ll now look at the Eve Pownall Information Books. 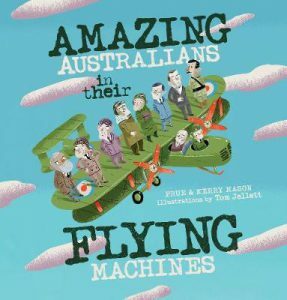 This book is structured chronologically with a focus on inventors and aviators we’ve heard of including Lawrence Hargrave, Nancy Bird, Charles Kingsford Smith, Rev John Flynn of the Flying Dr Service; and those we may not have heard of such as Dr William Bland (who appeared before Hargrave) in the 1850s. The structure and writing styles provide variety: words in the aviators’ voices; 3 Amazing Facts about most aviators; and ‘Did You Know?’ columns. The book acknowledges difficulties for women in the past who wished to fly. George Taylor In 1909 he flew a glider from Narrabeen, NSW. His wife Florence also flew, tucking her long skirts into her bloomers. At age ten Taylor wrote an essay, ‘The Future of Flying Machines in Australia’. He was a cartoonist and suffered from epilepsy. Bert Hinkler In 1921 he flew the nine hours from Sydney to Bundaberg wearing a suit and tie. His RAF flying instructor was Cpt W.E. Johns, who wrote the Biggles books. Like Lawrence Hargrave, children could make box kites. The ‘e-how’ website could be helpful. It suggests using dowel, bendy straws and a plastic/vinyl tablecloth. https://www.ehow.com/how_4882168_make-box-kites.html Alternatively they could make gliders or paper planes. 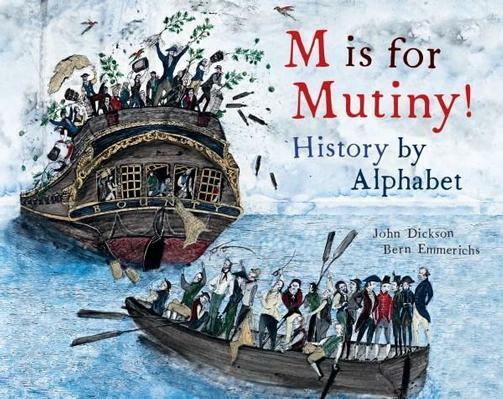 Structured as an alphabet book, this book is set during British colonisation of Australia but also explores ongoing preoccupations such as L is for land rights. The M is for Mutiny section could be linked with another book in this series, William Bligh: a stormy story of tempestuous times. Children could discuss why this letter has been selected for the book’s title and suggest alternatives from the book. 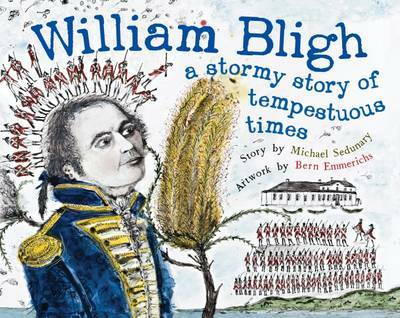 I is for Island could lead to reading the graphic novel, The Mostly True Story of Matthew and Trim by Cassandra Golds and Stephen Axelson. Decorative Patterning is used for sections such as J is for Jail and N is for Nurture. Children could select an alternative description for one of the letters e.g. C is for Convicts (instead of Cook) and create decorative patterning in Bern Emmerichs’ style. Like last year’s shortlisted book by this author, Gigantic Book of Genes, this is a glossy science publication with high quality photos. It includes seamless explanations of left and right with clear examples for children to understand. It includes a clever idea where children hold their hands out in front and touch their thumbs. Their left hand forms an L shape (helping them remember which hand is left). 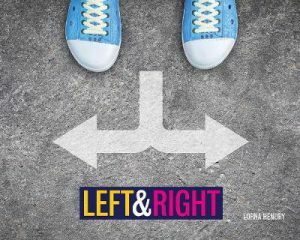 The author recognises that it is easy to mix up left and right and looks at situations where right may connote good and left signify weak or bad. For example, in Albania it has been a crime to be left-handed. It features symmetry, spirals, clockwise and anticlockwise, and the compass. 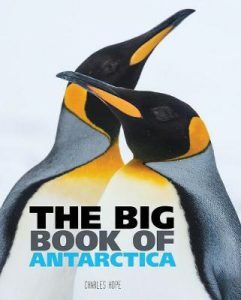 The author includes incredible information, such as ‘Nearly all kangaroos are left-handed… Parrots use their left feet to pick up food.’ ‘Female cats tend to be right-handed, and male cats … left’. And when driving, island nations tend to drive on the left-hand side of the road. 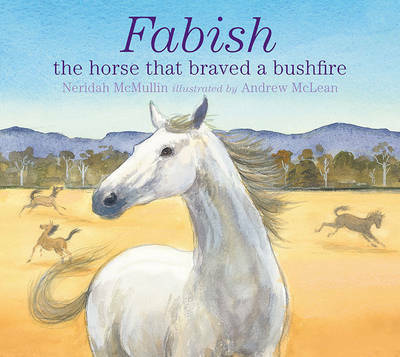 I’ve already blogged about the CBCA shortlisted Younger and Older Reader books. In two parts, I’ll now look at the Eve Pownall Information Books. Min is a microbe. She is small. Very small. In fact, so small that you’d need to look through a microscope to see her. 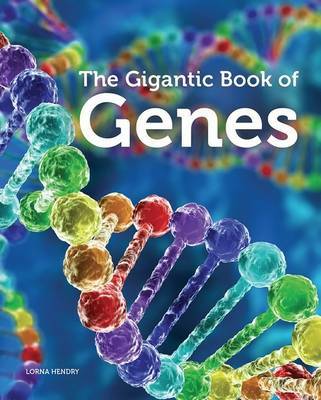 I know from comments by a young family that this tactile, interactive book about microbiology has great appeal. 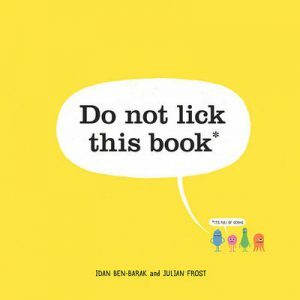 The title is provocative – tempting and almost urging children to lick the book. Min the microbe guides the reader through the informative content, which is well designed with bright comic style illustrations and high-quality photographs. The information is clever, irreverent and quirky. It probably reflects the creators – a team consisting of writer Idan (quiet loud thoughts), Julian (who likes comics and toast) and Linnea, the scientist. Children could consider, ‘Where will you take Min tomorrow?’ Like the book, they could take Min on a journey using a mix of photographic backgrounds, cartoon characters and written text. Hygiene is taught and encouraged using reverse psychology. Teachers and parents may use the book to reinforce good hygiene (without losing the text’s inherent appeal). Koala is most appropriate for the very young. It traces the experiences of a young koala achieving independence. 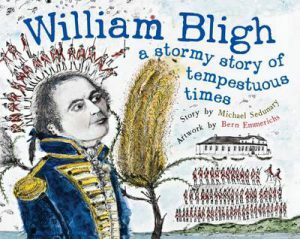 The writing is both literary and factual: providing parallel texts which are particularly useful for children who prefer one style over the other and to expose readers to both forms. The illustrations are distinctive for their rounded lines and shapes. Children could make finger puppets using the following free template http://www.makefilmplay.com/kids-crafts/how-to-make-this-koala-finger-puppet-with-a-free-template/ or cut rounded shapes from felt (and sew and stuff) to make a koala. They could use these to re-enact the koala’s movements. 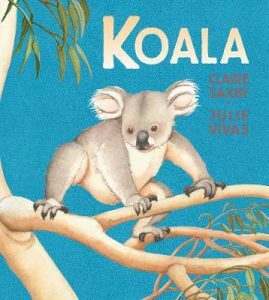 Koala is part of Walker Books’ excellent ‘Nature Storybooks’ series. Others include Claire Saxby’s Big Red Kangaroo, Emu and Dingo; and Sue Whiting’s Platypus. This could also be a good opportunity to introduce the classic Blinky Bill by Dorothy Wall. This is another big, glossy production from Wild Dog Books. The photos are exceptional. There is minimal written text and key words are shown in large coloured font. Ice is looked at on page 22. There are many experiments about ice in other books and online to extend this subject.